Medical grade compression garments help many patients effectively improve on the venous and lymphatic blood flow of the lower extremities and are used to prevent and treat poor circulation. Compression garments help relieve and control edema, swelling, varicose veins, leg fatigue and other problematic leg conditions. The staff at Paradise Physiotherapy is trained to fit your custom hosiery product and decide which would be the best product for you. Paradise Physiotherapy now carries Lunatik performance and compression socks. We chose Lunatik Athletiks because they are committed to creating synergies of fabulous design with medical efficacy so our clients can express their unique personality. With both the technical efficacy of a modern day graduated compression sock and a fashionable bespoke design, one can wear this type of sock everywhere every day. ACHI socks are created from the philosophy of understanding what motivates you and staying authentic. From extreme endurance athletic endeavors or a walk to work, Lunatik Athletiks strives to share their passion for expression with premium fit and function. These socks are thoughtfully designed in Canada and worn all over the globe! 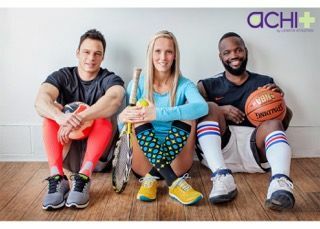 ACHI Performance Socks consistently increase the stabilization of lower leg muscles and oxygen delivery. Targeted compression zones decrease the risk of Achilles injuries, shin splints, blood clots and muscle fatigue. The socks keep your feet dry and blister-free with anti-chafing covered inlay yarns for maximum breathability. One can perform faster for longer with less muscle injuries when you wear ACHI Performance Compression Socks. There is research based evidence that supports wearing graduated compression socks for ultra-marathon, triathlon and elite athletes. A referral from a medical doctor is required for medical grade compression socks to be covered by insurance.